In an exposé of the later eighteenth century called Jachin and Boaz, there is an interesting mention of a lodge in Ireland that admitted a woman, the anonymous author of the work stating that she was ‘as good a Mason as any of them’. On a recent visit to Cork where I was giving a talk to Lodge No. 555, I had the opportunity to find out more about this mysterious Lady Freemason as to my surprise, the Cork Masonic Hall still celebrated the connection to this enigmatic figure. A portrait of the Lady Freemason hangs in the dining room of the Masonic Hall, along with what is believed to be her apron and a special jewel that supposedly belonged to her, and a Memoir of the Lady Freemason was actually published in the early nineteenth century in Cork. So who was this Lady Mason? And is the story true? The Lady Freemason is named as the Hon. Elizabeth Aldworth, born in 1693, the daughter of Arthur St. Leger, first Viscount Doneraile, who was said to have held a lodge in his home at Doneraile Court, County Cork. According to the Memoir, it was at one of these lodge meetings that Elizabeth overheard the activities of the lodge while reading in the library room next door. Some of the bricks from the dividing wall between the library and the room where the lodge was meeting could be removed, so Elizabeth was able to watch the lodge proceedings through the narrow gap. After watching the meeting and understanding the importance of the secret nature of the ceremony she had witnessed, Elizabeth then tried to escape the library be leaving through a door that would lead through the far end of the room where the lodge was held, and, if she was quiet enough, she hoped she could escape without notice. However, on turning the handle and opening the door, she was confronted by her father’s butler who was acting as Tyler, and after raising an alarm, she was ‘detained’ in the library. The Brethren of the lodge then discussed what best to do; their secrets had been revealed and the mysteries of their workings may have been under threat, so a decision was made to make Elizabeth a Freemason. The date of her initiation can only be speculated upon, as there are no actual lodge records and no actual mention of Elizabeth at any other lodge meeting, but a date between 1710-1712 is presented in the new edition of the Memoir. Elizabeth married Richard Aldworth of Newmarket Court at St. Finbarr’s in Cork in 1713, and she died in 1775. The actual evidence for the Lady Freemason is, on the whole, rather slim to put it bluntly, but there is a mention of a recorded testimony by a certain Arundel Hill Esq., of Graig, Cork, who claimed that he was at her initiation and sat with her in the lodge. However, this comes from a later document that only dates to 1862, well after the event. 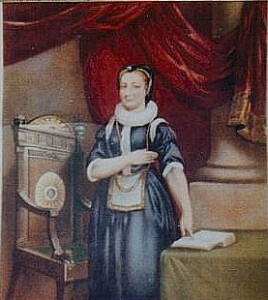 There is also the apron of the Lady Freemason, which had been preserved as an heirloom at Newmarket Court, and there is a miniature portrait of Elizabeth with the aforementioned Masonic jewel, which is also now held at Cork Masonic Hall, though this has been dated to the early nineteenth century. There were early lodges recorded in County Cork, and there was of course the independent Grand Lodge of Munster which operated between 1726-1735, but no record of Elizabeth at a lodge has yet come to light. Elizabeth was buried at St. Finbarr’s Cathedral in Cork, and a brass memorial plaque was placed there later by the Aldworth family which celebrates her as a Freemason and as being initiated in 1712 into Lodge No. 44 held at Doneraile Court. Lodge No. 44 however, is only recorded as existing at Doneraile in the later eighteenth century, though it has been speculated in the new edition of the Memoir that this lodge could have been a successor to the Lady Freemason’s older unwarranted Mother Lodge. Despite the lack of contemporary records, the belief in the Lady Freemason of Cork is as strong as ever.